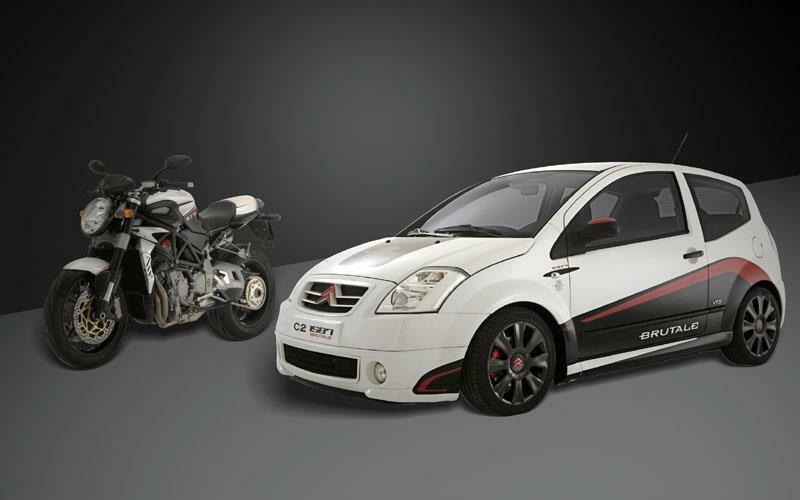 Italian motorcycle firm MV Agusta has teamed up with French car manufacturer Citroen to create a special show car for the My Special Car Show in Rimini, Italy. What they have ended up with is the Citroen C2 1587 Brutale. The car is based on Citroen's range topping VTS, but features a special Brutale-style paint scheme and improved interior. The paint scheme follows the same pearl white/black paint scheme of the MV Agusta Brutale 1078RR and has been studied by MV Agusta's style centre to make sure it's a perfect match. Inside the car features alcantara seats, with leather detailing, an alcantara steering wheel and carbon fibre effect dashboard and foot plate.